Lizzie and Karl's mother is a zoo keeper; the family has become attached to an orphaned elephant named Marlene, who will be destroyed as a precautionary measure so she and the other animals don't run wild should the zoo be hit by bombs. The family persuades the zoo director to let Marlene stay in their garden instead. When the city is bombed, the family flees with thousands of others, but how can they walk the same route when they have an elephant in tow, and keep themselves safe? Along the way, they meet Peter, a Canadian navigator who risks his own capture to save the family. 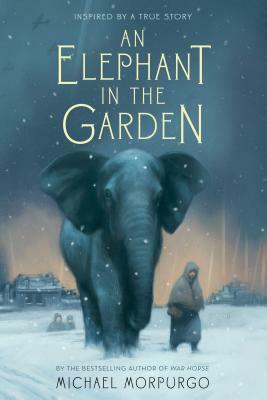 As Michael Morpurgo writes in an author's note, An Elephant in the Garden is inspired by historical truths, and by his admiration for elephants, "the noblest and wisest and most sensitive of all creatures." Here is a story that brings together an unlikely group of survivors whose faith in kindness and love proves the best weapon of all. Michael Morpurgo is the author of more than fifty books for children, including An Elephant in the Garden, Shadow, A Medal for Leroy, and Listen to the Moon. He is also the author of the New York Times bestseller War Horse, which debuted on Broadway and also became a film by Steven Spielberg. He has had several of his novels adapted for film and television.